Happy New Year to everyone! In December, the EURO dropped to a 5 year low against the USD thanks to the help from the European Central Bank announcing it has extended its quantitative-easing programme beyond its horizon of March 2017 and the anticipated the US Federal Reserve Bank interest rate hike. The US equity markets rallied in December as what media is calling the "Trump Bump" with the Dow Jones Industrial Average achieving a 12 month high almost reaching 20,000. Many traders feel that it will be a trader's year in 2017 as monetary policy and the upcoming European elections will be the main drivers for market volatility. UK's Financial Regulator (FCA) proposed new guidelines for Brokers that they must disclose client profit-loss ratios, leverage limits up to 50:1 and new clients under 12 months experience leverage limits up to 25:1 as well as suspend all bonus practices. Effective no later than January 30, 2017, the Cyprus Financial Regulator (CySec) proposed new guidelines for Brokers that they must suspend all bonus practices, process client withdraw requests same day, and leverage limits up to 50:1 unless a client passes a suitability test to get the leverage limit increased. Central Bank of Ireland reported a material increase in licensing inquiries from FCA regulated firms since Brexit. German Financial Regulator (BaFin) proposed that CFD brokers are required provide negative balance protection to their trading clients. FX Junction membership and linked accounts reached an all-time high in December with 23,206 members and 9,226 linked accounts. As 2016 came to a close, FX Junction new membership boasted a 28% increase over 2015. In addition, FX Junction trading volume ended the year on a strong note reaching over 300,000 trades for the third time in 2016. 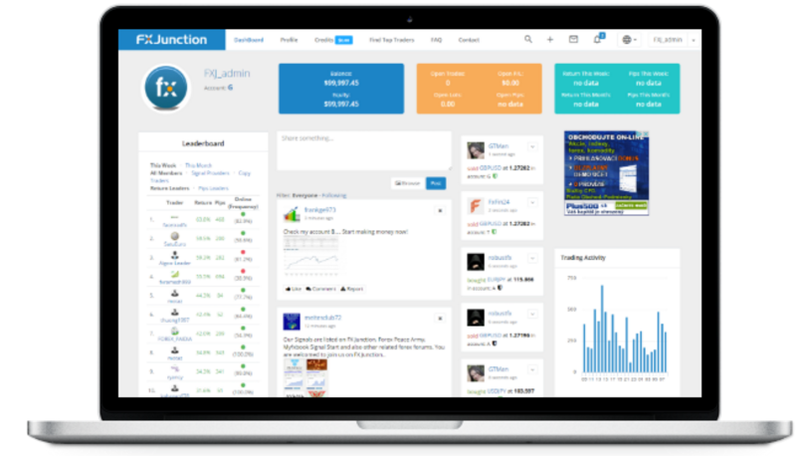 In December, members with live linked accounts on FX Junction continued to show strong profitability by posting a 60% profitablitity ratio, which is the percentage of linked live accounts on FX Junction which were net profitable for the month. Language Translations: Soon to be released is FX Junction translated into Russian and Indonesian. Please share your profile, our website, and newsletter on your social pages. It’s more fun to trade together! Great improvement. Keep up the good work guys. Thank you. Let's praise God for FX Junction growth in 2016 :) wish all the best in 2017 ! Nice to be with you. Thanks FX Junction.